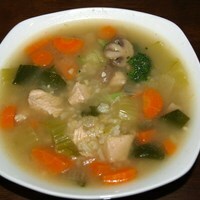 Sliced shitake mushrooms, bok choy, and a soy -ginger flavored broth give a subtle asian flavor to this turkey and rice soup. Easy to make, healthy, and delicious! In 4-6qt slow cooker, combine broth, turkey, mushtrooms, water, carrots, onion, soy, ginger, and garlic. Turn to high heat and stir in bok choy and uncooked rice. Cover and cook for 20 minutes or until rice is tender. My kids and I both love this one. Serve a little spicy chili sauce on the side for the adults!